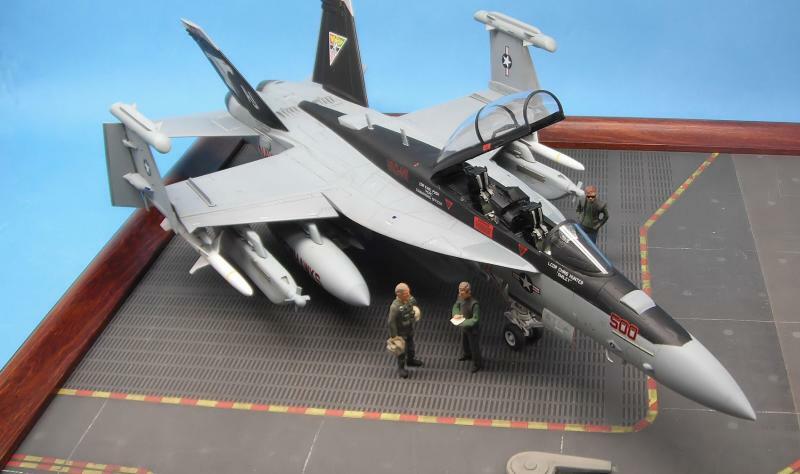 Freshly released from Hasegawa and Hobbico is the best 1/48 scale version of the E/A-18G Growler. 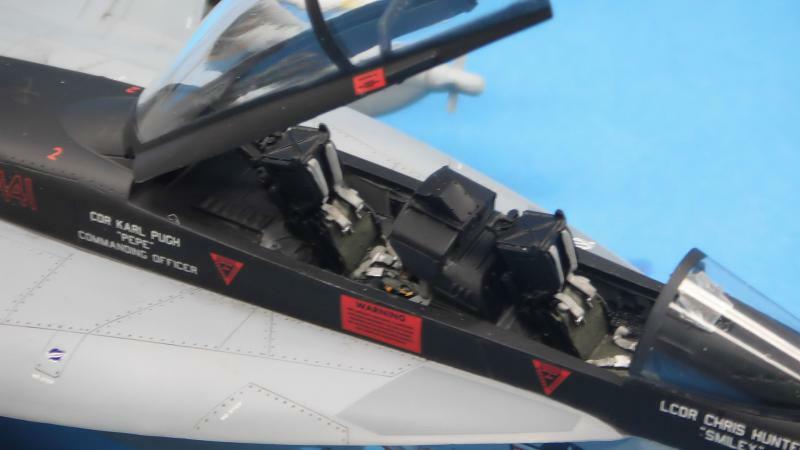 This is a modification of their F/A-18F two-seat Super Hornet Kit including four new sprues to allow for the radar jamming pods, extra bumps and antennae and cockpit differences. All the parts are nicely done with engraved panel lines and no flash. 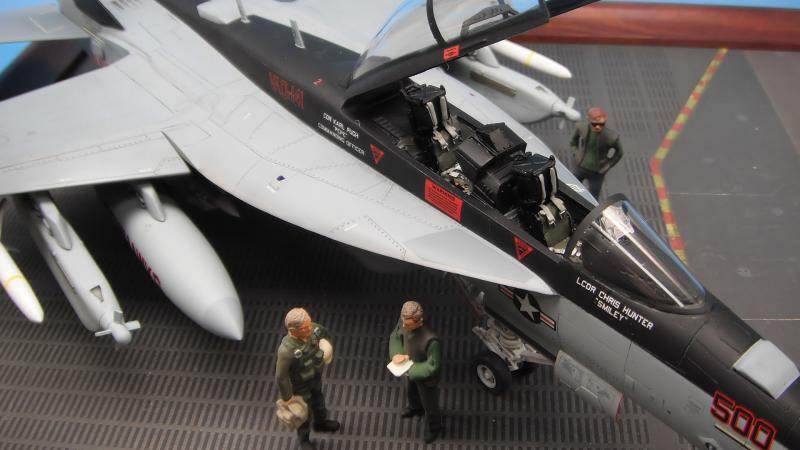 Marking are included for lo-viz VFQ-129 Vikings and the CAG from VFA-141. I chose the latter with its black spine and tails- great looking plane. The kit has several up front things to do. Since this is a modified F version, there are a bunch of holes to open on the forward fuselage, wings, and rear fuselage to allow adding of the changes peculiar to the G version. I missed doing this to the wings and made life much more difficult as this plane has lots of "things under wings". I also decided to fold the wings. This involves some cutting but looks great and the hinges are included. 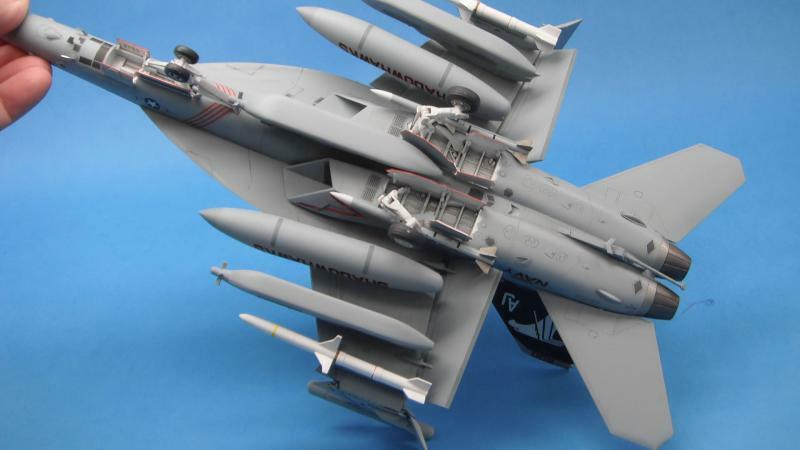 If you have built one of Hasegawa's Hornets, you know to expect a fairly large part breakdown- the front fuselage is three parts plus the cockpit. There are also lines to fill and scribe here plus the gun ports need faired over. This builds pretty straightforward and I painted the cockpit detail instead of using the supplied decals. The rear fuselage is 18 parts and needs aligned. Go slowly and this will assemble well with minimum putty needed. 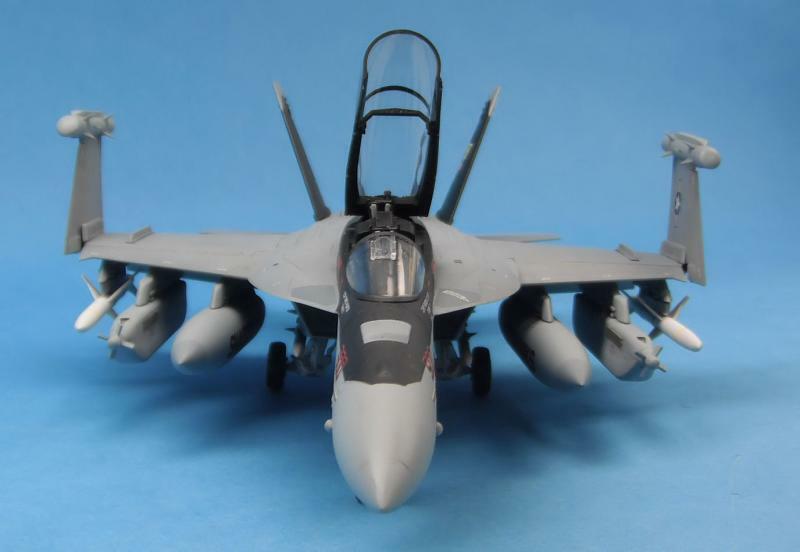 I did not use the kit intakes but instead used TwoMikes resin F-18E/F intakes. I like these because they are already painted white so don't need anything at all to work and they fit. I assembled the intake. Painted it FS36375 and plugged the intake in for a prefect demarcation. The front and rear fuselage was joined and the tails assembled and fitted. At this time, also decided to close the ladder and sealed it shut. One reason I really like the Hasegawa kit is that the flaps and slats are all separate and really well done. I propped all of these and added the hinges in the correct position. It's a lot of pieces (28 part) but it looks great dropped and that was the position I was going after. Last, I prepped the stores- and this plane carries a lot- Each wing tip has an ALQ-218 pod. There are two GM-88E missiles on the outer pylons, two ALQ-99 High Band ponds on the middle pylons and the inner pylons have 480 gallon fuel tanks. The centerline is an ALQ-99 Low band Pod. Once all of this was prepped and set, it was time to start painting. The bottom of the plane was painted FS36375 and the top and FS36320. I used the excellent Gunze paints for this. The spine was masked and painted black along with the canopy and tails. The trailing edge of the flaps and rudders was masked and painted FS335237. The wheel wells and all the gear doors got a coat of FS17875 and the plane was left to dry. I used Alclad's clear and gloss coated the plane. I love this stuff- dries rock hard and quick and accepts decals well. I also used Alclad for the exhausts. I took my time adding decals as this plane has a lot of stencils. They settled well and I gloss coated and washed with a light brown version of water based color. These planes are still relatively new and pictures of this particular plane show almost no weathering yet. Now came the slow part. Adding all the landing gear doors, the multitude of antennae and missiles and pods. Once done, Dull Cote all over and adding all the clear parts. I decided to add some resin seats with molded in belts as it added a nice touch to the cockpit. I really like this plane and the color scheme. Hasegawa also has a low-viz version out and it too would be a great build. Due to the complex nature of the build, this might take a little experience but I am sure beginners could do it with some patience. 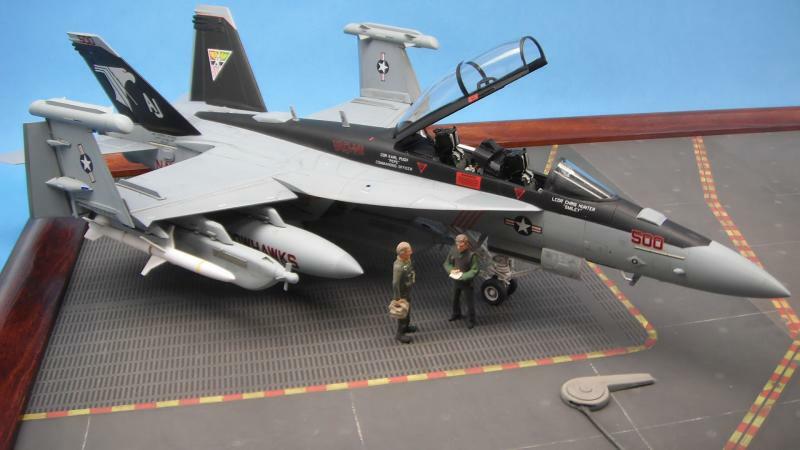 Hasegawa's F-18's are still the best in the business and this only adds to the claim. Highly recommended to lovers of the Super bug and naval Aviation. My thanks to Carol Pesch and Hobbico for the review sample and IPMS/USA for the chance to review it.